Engineers who get to design precise little gadgets, like pocket knives and multi-tools, have some fun variables to play with. The tools can take a variety of shapes, function in a multitude of ways, and can include everything but the kitchen sink or just the bare necessities. What is important is that they function properly, have all the bits you will need, and are built to hold up for many years in sticky packs and sweaty pockets. I recently took a look at five unique multitools, each with their own intended uses and strengths. Since there is no “best tool for everyone,” these folders were selected for their standout features, and are listed below according to how they tipped the scale from lightest to most robust. 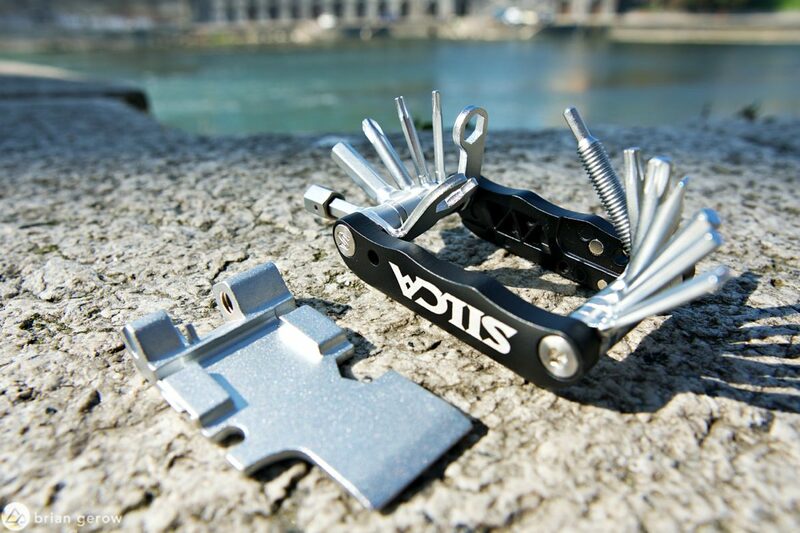 The svelt 8-In-1 pocket saver from Pro Bike Tool is about as small as a useful multitool can come. It includes most of the bolt and screw tips you might need, with ample frame rigidity to provide proper leverage. The tool was clearly designed with tight tolerances in mind, and all of the bits slide into place with a similar feel of a top-shelf folding knife. The clean polished aesthetic of the 8-In-1 is reminiscent of the tools that jewelers and clockmakers use, and is the perfect utensil for folks who like every last piece of their gear to look good. Each bit and connecting bob that makes up this tool is fashioned from cold forged steel, so you can hamfist your way through all the bolts on all of your friends’ bikes over several seasons before you will turn an edge on one of these drivers. With the brilliance of tubeless tire tech comes a slew of hard to mount rubber. After breaking a few hundred tire levers, I eventually came across the yellow pry-bars from Pedro’s, and today I don’t bother with anything else. They are strong enough that I have only managed to break one pair, on a tire/rim combo that also bent a metal lever and was eventually abandoned. In short, Pedro’s makes tough stuff. Enter the Rx Micro-20. This folding gizmo’s robustness-factor is backed by Pedro’s lifetime rust-free guarantee, so you can sweat on it all you like. The frame is encapsulated by two smaller tire levers, each with a space to keep half of a spare quick-link at the ready. 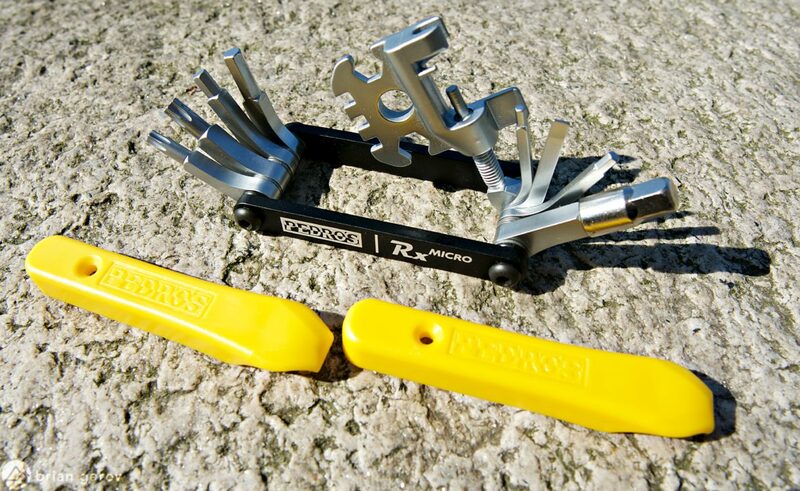 With the included Shimano crank cap tool, an 8mm hex bit, and three different spoke wrenches, the Rx Micro could cover the majority of your home bike repairs without cracking open the toolbox. 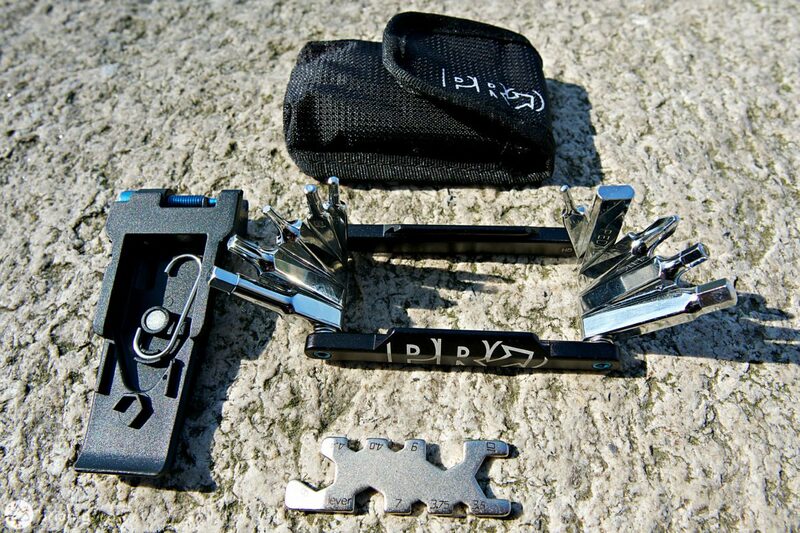 The integrated chain tool has just enough handle to break the chain without breaking your skin. If you have ever used an itty bitty chain breaker you know how valuable a little leverage can be, and this one works rather well. 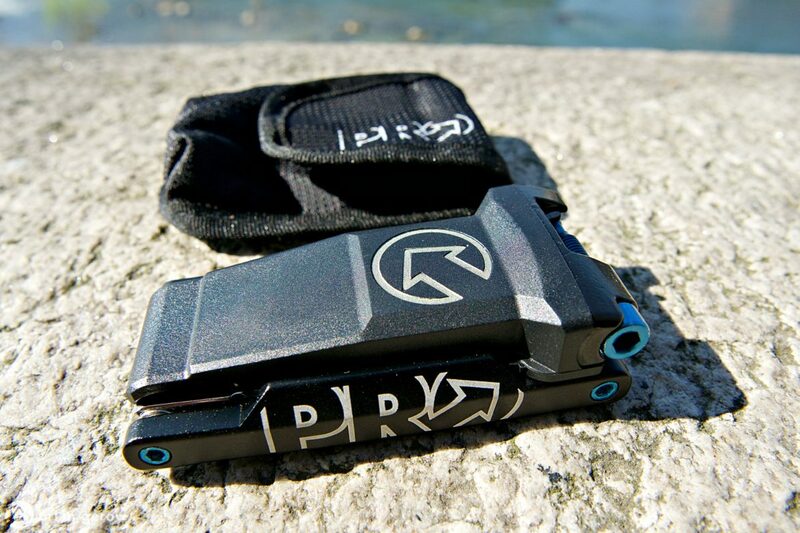 The 2-piece Monster Air packs into a unique shape, 1- 2cm longer than its folding friends, and roughly the same width. 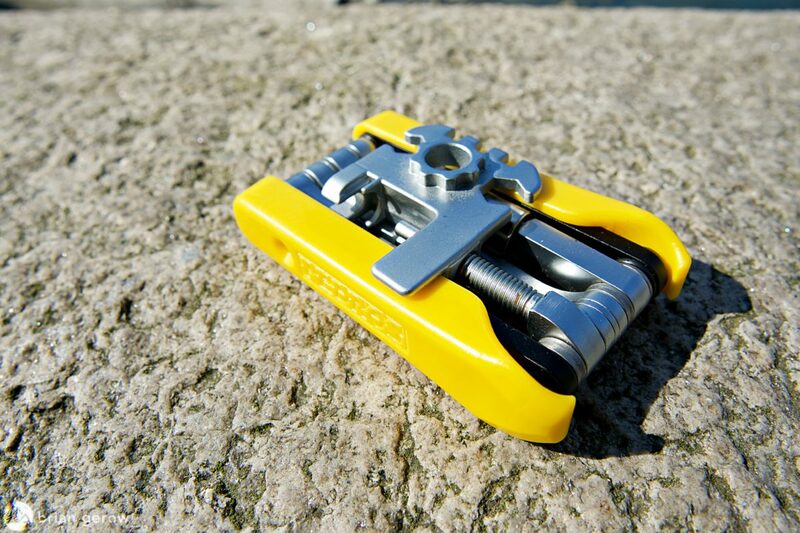 Topeak’s Tool Monster Air is unique in both form and function. Every available surface on the frame is used for a tool cutout or attachment. 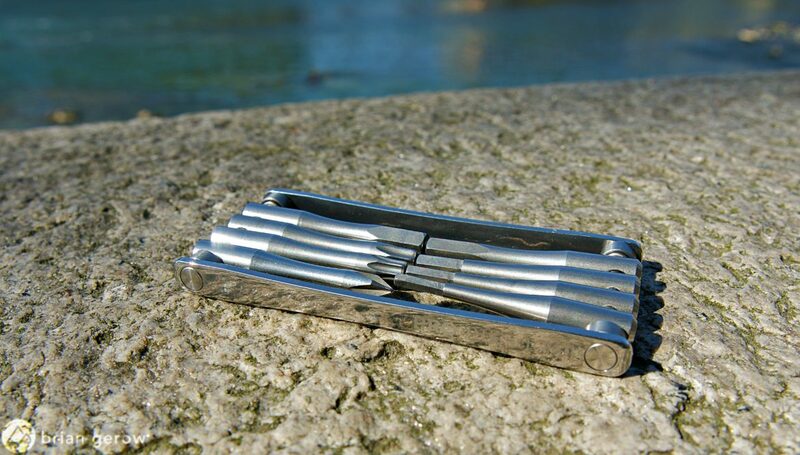 The 1.5-3mm hex keys are bolted to the main body and can swivel to meet most angles. The rest of the hex bits are on a second piece that connects to the main frame, doubling its length for added leverage. These two pieces are held together by a few well-placed magnets and a hook-and-loop strap. I replaced the strap with a heavy rubber band so I could have one with me for various emergencies, and to hold the tool and CO2 cartridge together. I recently had to take my Rockshox digital suspension pump apart to swap the battery, and the tiny 1.5mm hex key came in handy. This is the only multitool I have found with a hex-spread from 1.5-8mm. 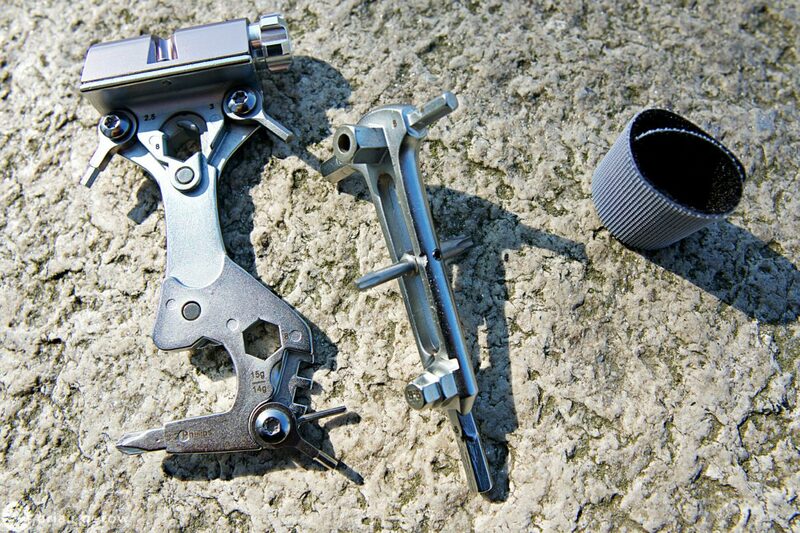 The two pieces of the tool body hook together to provide additional leverage. The Monster Air could be the perfect backcountry device if only it had a chain tool. 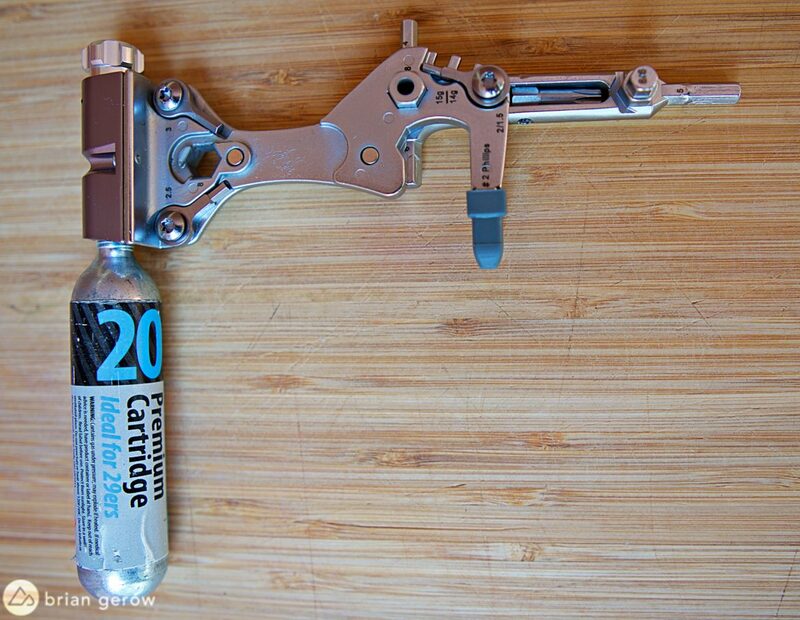 Topeak does make a similar setup that swaps the CO2 inflator for a chain tool. If a solid chain breaker is what you’re after, the Pro Mini Tool 22 has you covered. The tool’s large handle gives it a similar feel to shop chain tools, without the unnecessary heft. 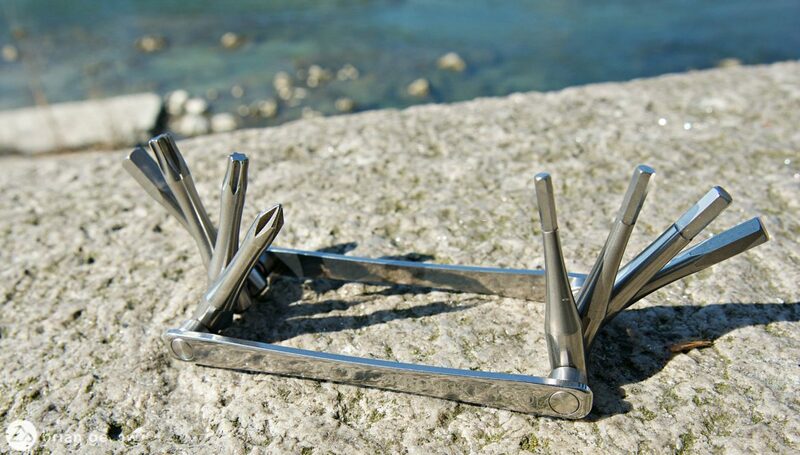 Two main body bits slide apart to reveal a standard 10-piece multitool in one hand, and a chain tool with an additional 9 functions in the other. The final two functions are the chain tool itself, and a clever hooked wire to hold your chain together while you mount the quick link. The Mini 22 falls into the odd realm of “feels even lighter than it is” with a smooth and comfortable frame. Each of the bits is chrome plated, adding to their lifespan and overall good looks. I managed to cram a small tire plugging tool into the sheath, which seems sturdy enough to last a few seasons. Alternatively, you could fit some tire patches or a few bolts in there if you needed to keep them in one tidy place. 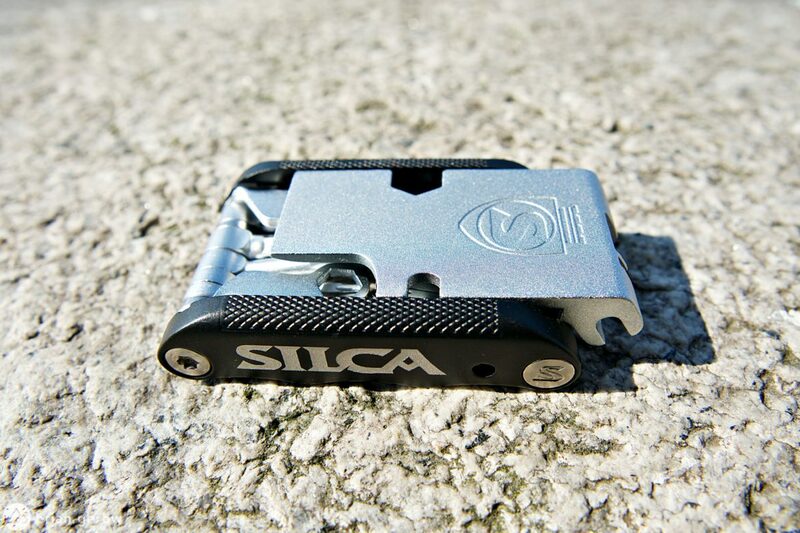 The heaviest tool in the lot by only 5 grams, Silca’s Venti is by no means an anchor. Venti is the Italian word for twenty, not just a frappuccino measurement, and the 20 bits on this tool are ready for far more action than any 20oz cup of cold, sugary milk. Like the Pro tool above, the Venti has a solid chain tool, four Torx bits, and most of the typical drivers you will need to keep your bike together on the trail. Standout features on the Venti include a brake pad spreader and three useful spanner sizes. 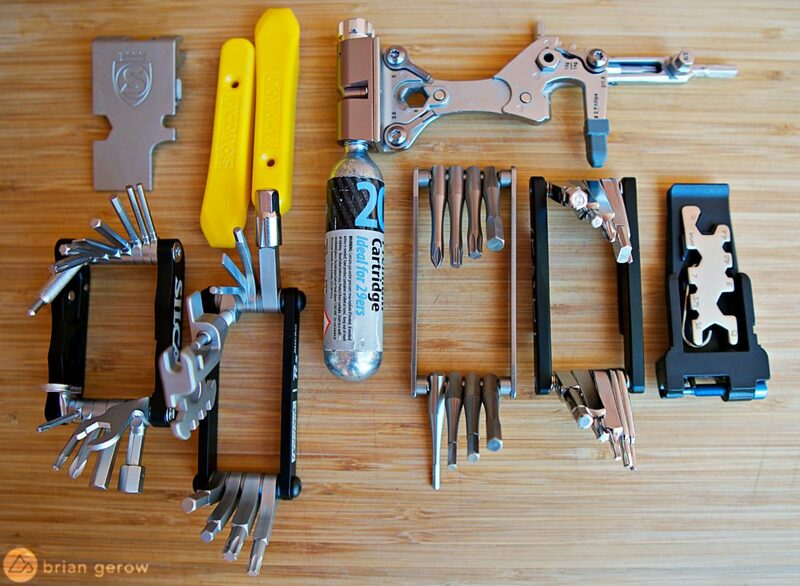 Though you may not need these tools on the trail, they can be helpful if you are traveling with your bike and need to perform some more intricate repairs. 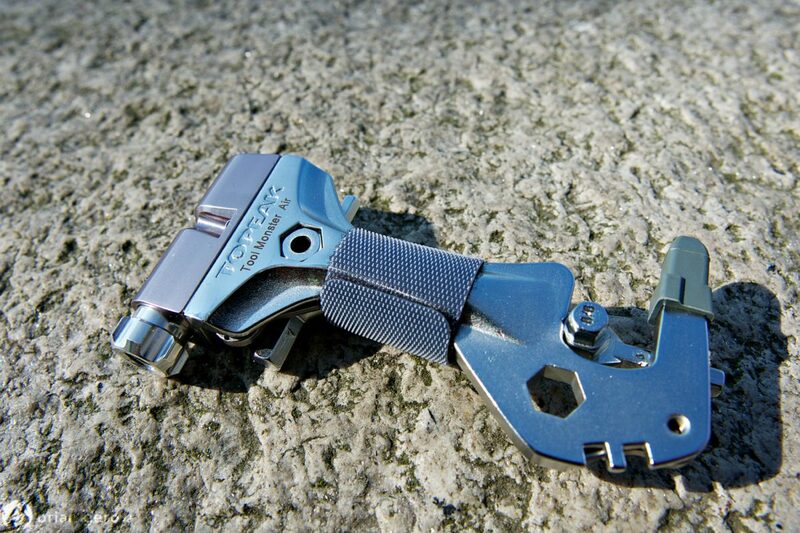 I have had to swap pads in a trailhead parking lot numerous times, and this tool would have been well appreciated. The venti has a two-piece body and the half with the chaintool slots into the main frame, help in place by a magnet. The two pieces don’t share the tightest bond, and I found it necessary to throw a rubber band around the tool to keep it from coming apart in my bag. When riding with a bag, or with a bike you don’t want to strap gear to, any of these tools are ready for most trailside jobs. I would love to see some of them incorporate a rotor truing slot, as that is one of the most common rock targets on the bike. Fortunately, rotors can often be trued well enough by prying with a trusty stick. If you are on the hunt for tools that you can pack in or on your frame, check out our recent stash tool roundup.